Tuesday in Derbyshire dawned grey and dank. I had only packed my Man from Del Monte outfit, so arrived at Chatsworth looking a trifle too tropical for the tepid conditions. I was not about to carry a Fedora around all day, so on my head it stayed. Perhaps I’m imagining it, but I am sure people are more deferential when they meet a man in a smart hat – I must wear one more often. Whether that’s true or not, it kept the drizzle off my glasses whilst I crouched uncomfortably on the metal walkway to take photographs of the show gardens. Totally untropical and not a pineapple in sight. 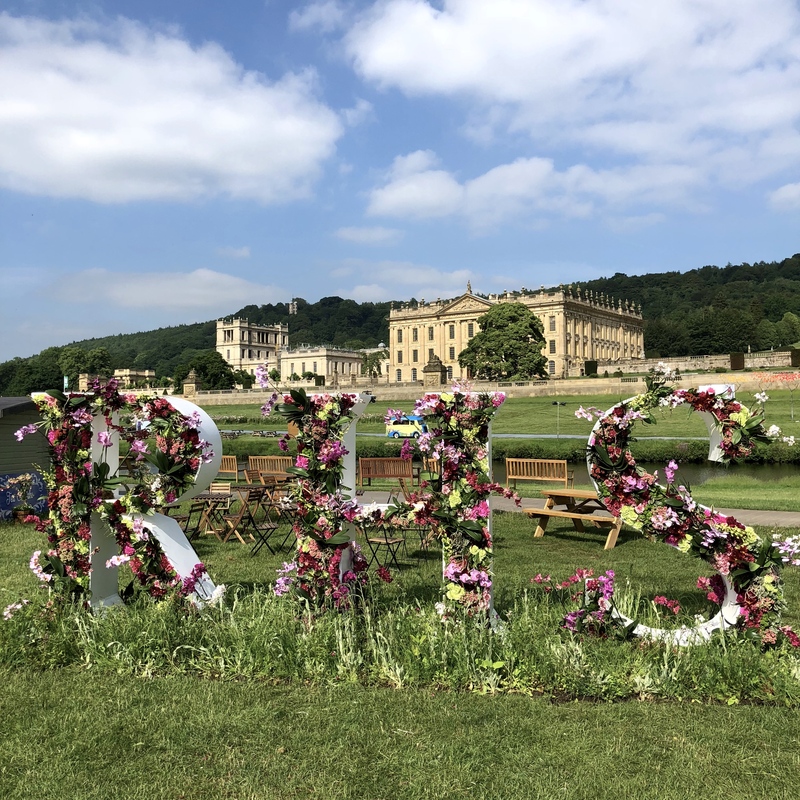 As expected, the number of gardens at RHS Chatsworth had dwindled significantly compared to last year: in fact there were only five. 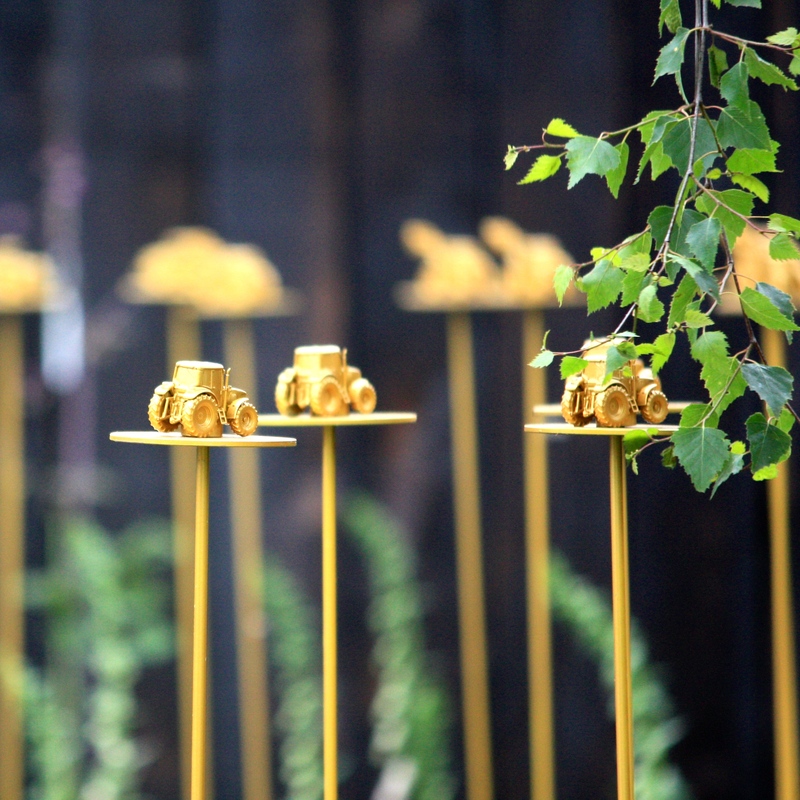 My suspicion is that sponsors were wooed and cajoled into staging gardens at the inaugural show, but decided not to return a second time, either for reasons of cost or disappointment with the return on their investment. Wedgwood, official partners of the RHS at Chatsworth, went from producing a full-on show garden to a section of limestone wall bisected by a gigantic sliver of glass. This was, apparently, inspired by Joseph Paxton’s Great Conservatory, though quite how is anyone’s guess. 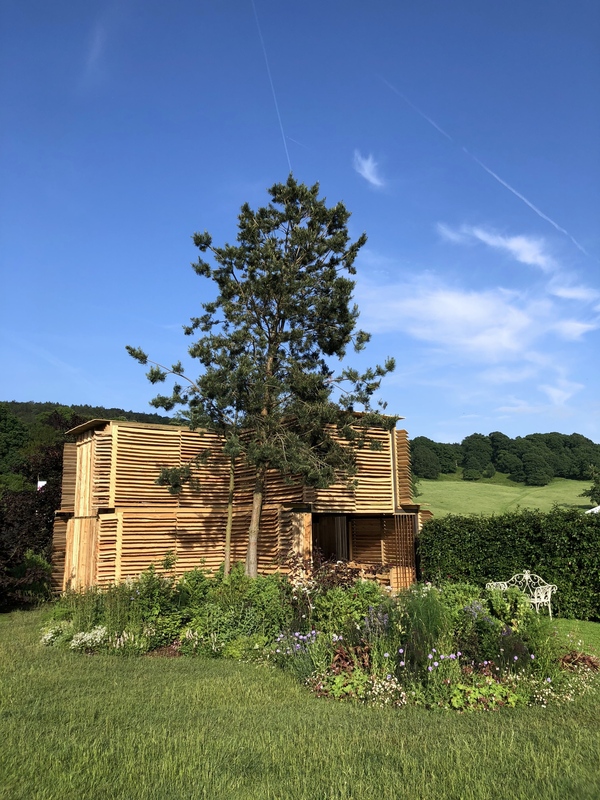 I’ll say it because I’m in a provocative mood, but the introduction of a category dubbed ‘Installations’ smacked of filling the void left by ‘proper’ gardens with something cheaper and less engaging. 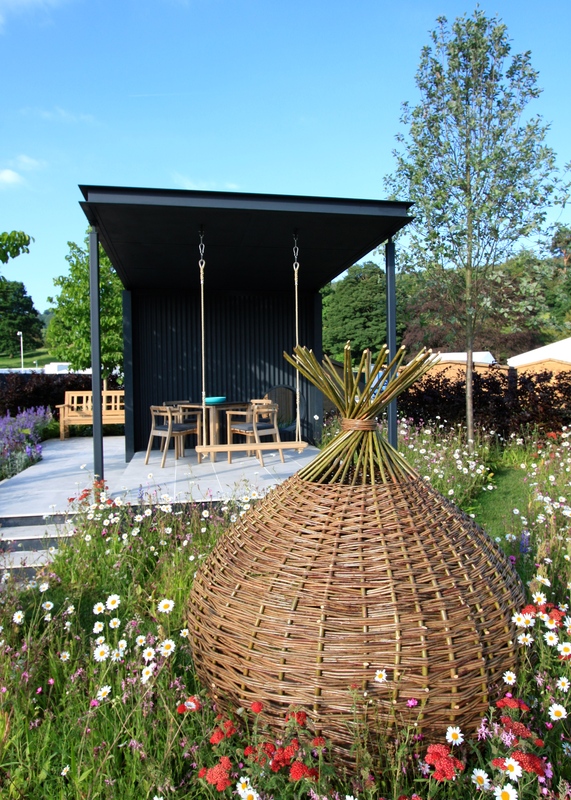 The problem is that I’m not sure installations are what visitors come to RHS shows to see. I certainly don’t. With the exception of Brewin Dolphin’s homage to a village that stood in the shadow of Chatsworth House before Capability Brown swept it away (pictured above), the installations were at best amusing and at worse dull. Crowds did not gather round them, only cursory photos and selfies were taken. I found the Long Border competition slightly more titillating, but the siting of these was not brilliant and the quality sadly lacking in some instances. As for the ‘river’ of cosmos, something had gone awry there. Moan over, otherwise I’ll never be allowed back. 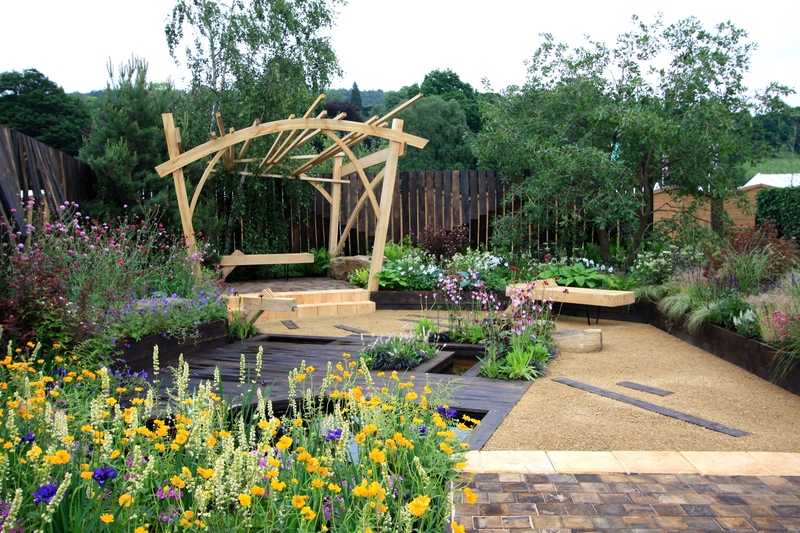 On a brighter note the show gardens that were presented at Chatsworth were good, with a couple heading towards greatness. 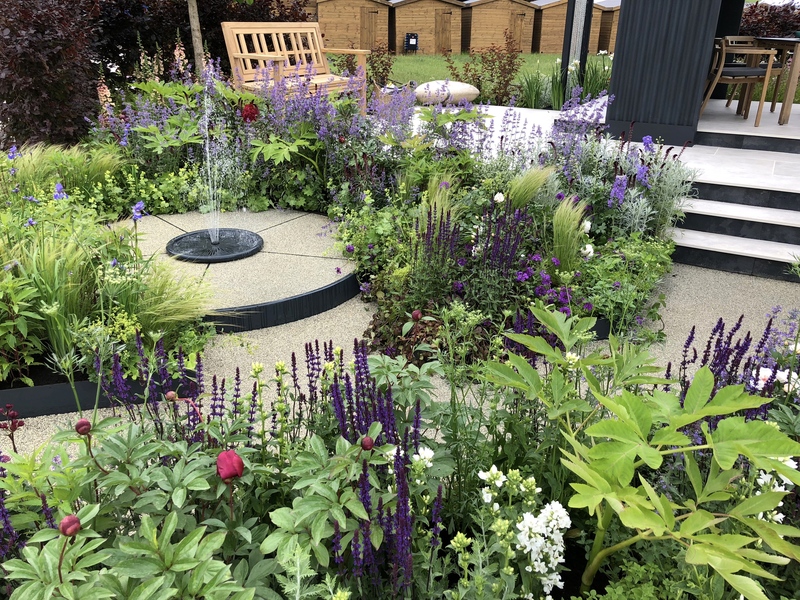 The close adjacency to Chelsea in the calendar means that few designers are able to create gardens at both shows, with the notable exception of Paul Hervey-Brooke’s who delivered at both and was still smiling at the end of it. 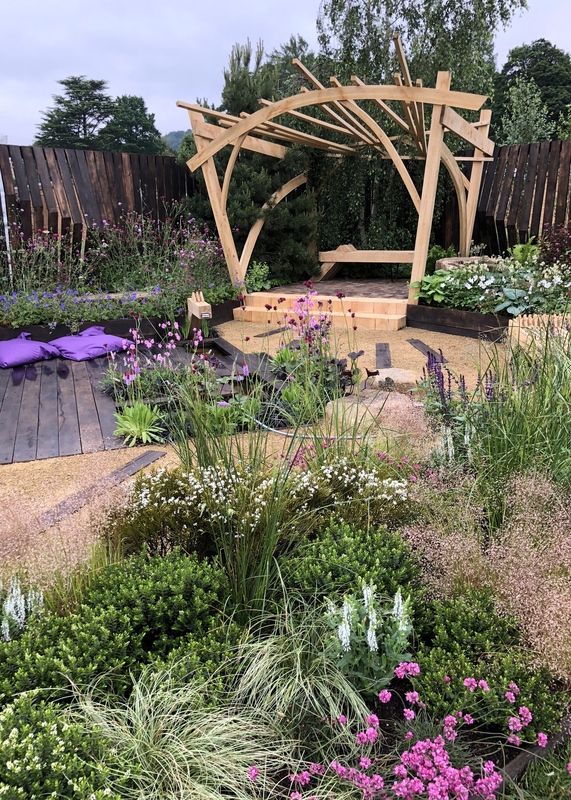 His garden for Brewin Dolphin was categorised as an installation and was therefore ineligible for a medal, despite looking for all the world like a garden. Confused? So was I. 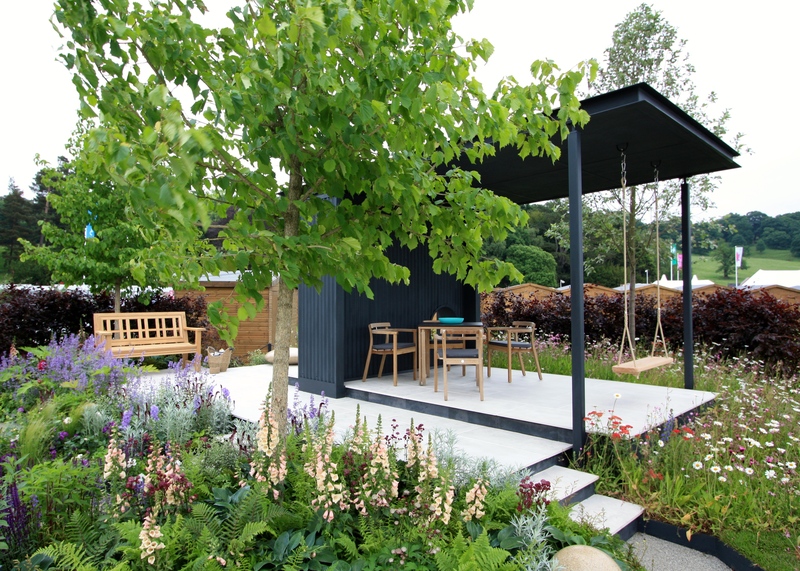 This garden had three distinct sections – a dining area beneath a modern, grey pavilion; a child’s play area comprising a flowery meadow surrounding an onion-shaped willow ‘den’; and an informal seating area with luxuriant planting around a bench and water feature. I felt the three spaces could have linked better visually, but overall the garden was very nicely done. 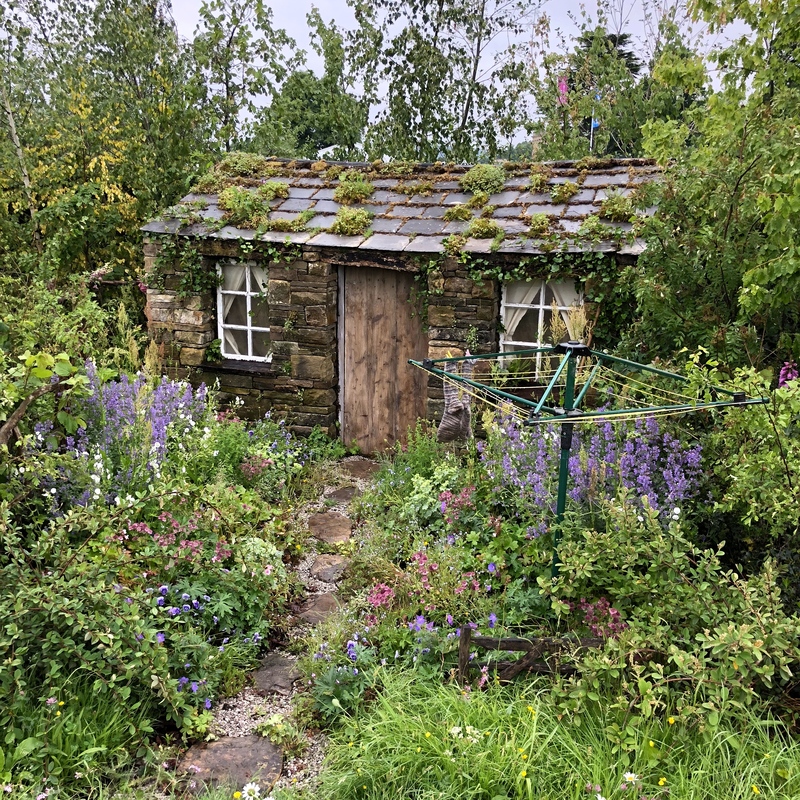 The downside for me, as it was for other Chatsworth gardens, is that the backdrop consisted of a row of garden sheds and a couple of ghostly white marquees. Why the RHS don’t think this through I do not know. I hope the designers challenge them to position the plots more sympathetically in future. Had the copper beech hedge at the back of this garden been continuous and higher, at least the ugly sheds might have been blocked out. Apart from that I felt the garden fulfilled its brief to create an attractive, safe space for a family of diverse ages. 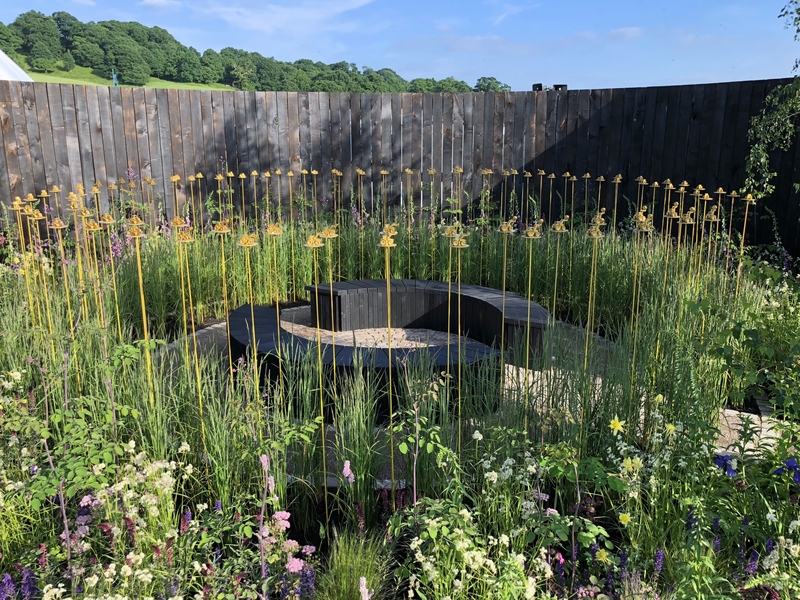 It looked its best in the early evening with the sun filtering through pale ox-eye daisies and illuminating the inviting seating areas. 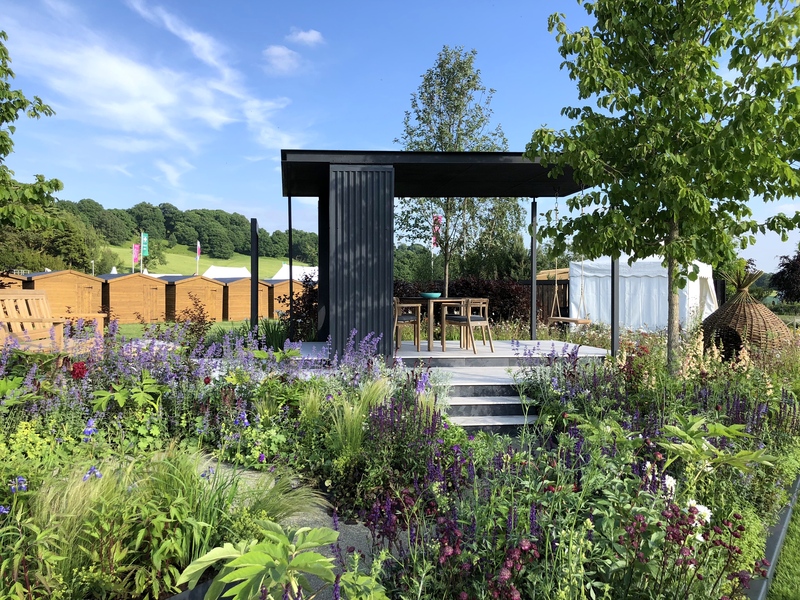 After the success of Mark Gregory’s Welcome to Yorkshire Garden at Chelsea, I felt sure that Hay Time in the Dales would follow suit with a gold medal. 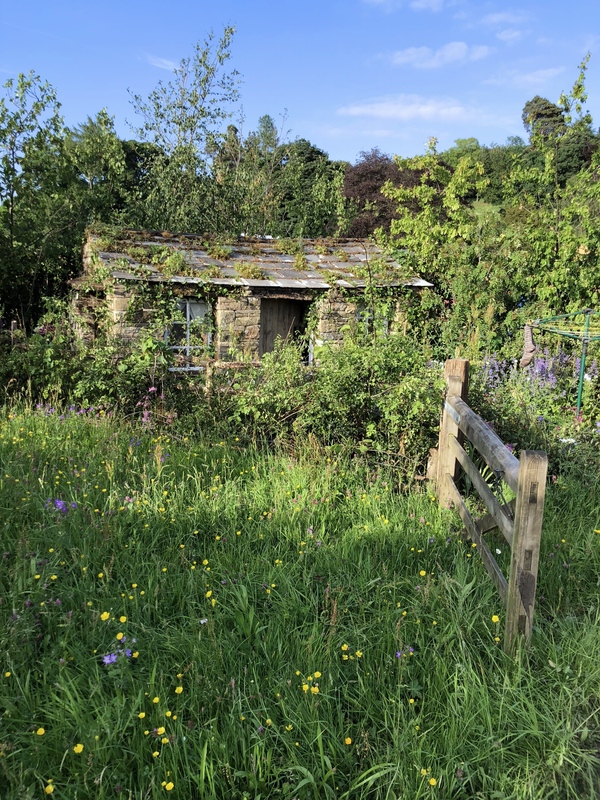 Although staged on a smaller plot, the romance and atmosphere captured by this garden was magical given it had only been in situ for a matter of days. On a cool, drizzly morning in early June it took no imagination at all to place this scene in the Yorkshire Dales. I loved all the little details such as the woolly socks on a rotary washing line and a sign on the gate reading ‘Winter food for stock. Please keep in single file’. 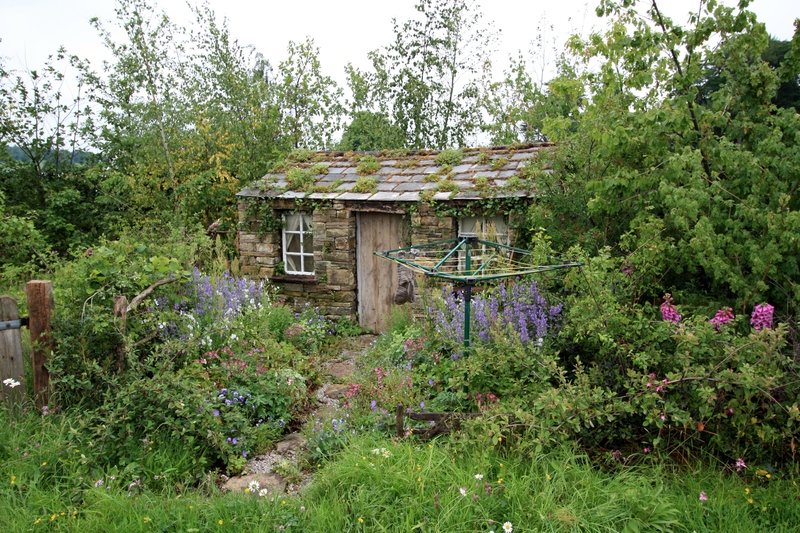 Plants emerged from and enveloped a tiny converted barn, its roof and walls encrusted with ferns, mosses and grasses. 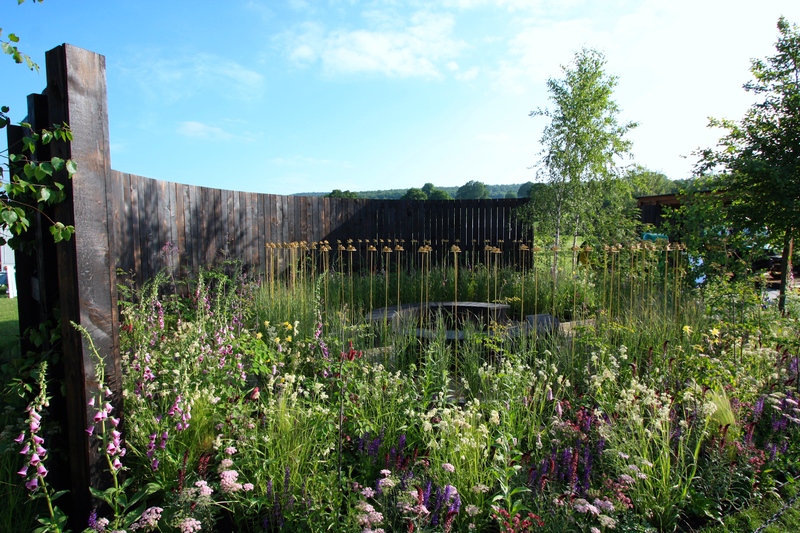 I wonder if the judges found the meadow area too loose and unstructured? I really could find no fault with Hay Time in the Dales, despite this not being remotely my personal style of gardening. Chris – you got my Best in Show if that’s any consolation at all. The Man from Del Monte – he say yes! 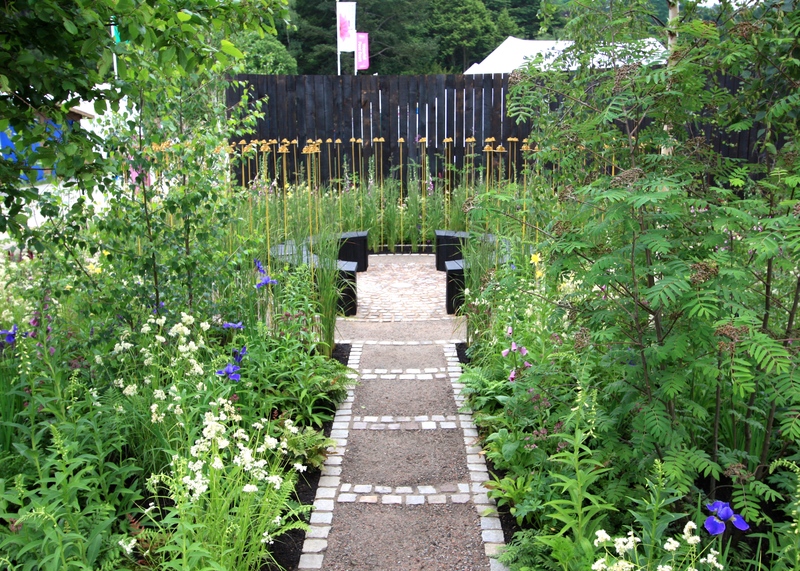 This was a solid show garden and deserved a gold medal. For me it felt ever so slightly dated, perhaps because of the colour scheme used, or the purple floor cushions which I could have done without. Something about the arrangement of green, purple, magenta, yellow and orange in geometric blocks reminded me of an 80’s shell suit. Once imagined, this is a hard image to shake! 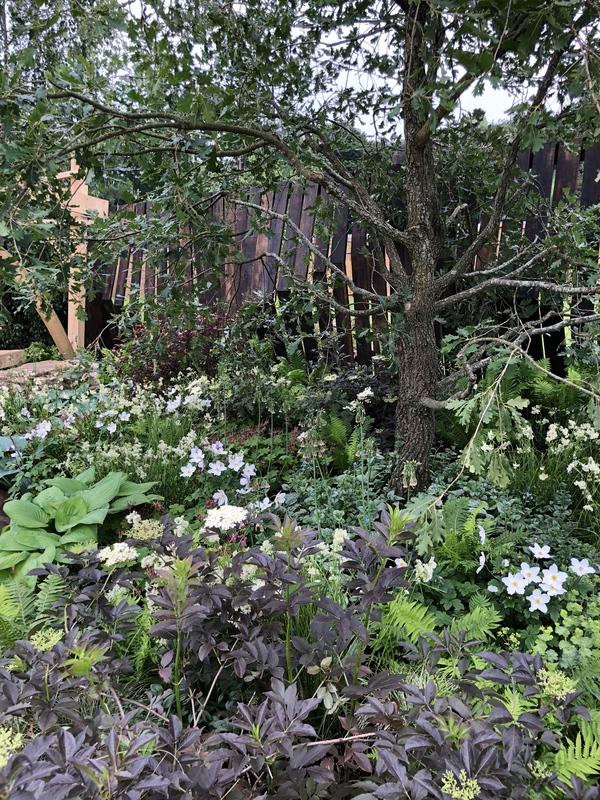 However some of the planting was divine, especially towards the back of the plot where luminous Anemone ‘White Swan’ romped about with hostas, ferns and black-leaved elder in the shade of a young oak tree. There was heaps of interest in structures, seating and surfaces, including a section paved with handsome wooden blocks laid end-on. One for that infamous professional couple we last met at Chelsea I don’t doubt, but a little too jumpy and jagged for my taste. Who would have thought a garden celebrating 100 years of tractors could be attractive to anyone other than a 6-year-old boy or a farmer? 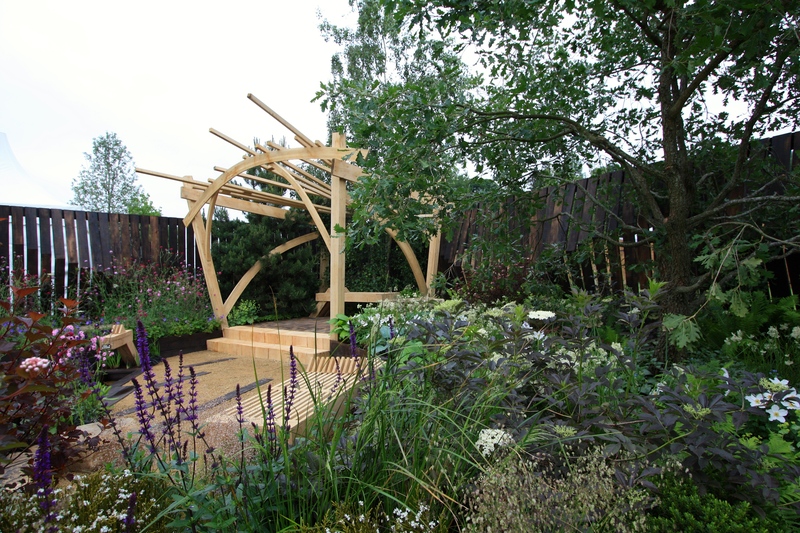 Well, designers Elspeth Stockwell and Jo Fairfax succeeded and landed a silver gilt medal for their efforts. 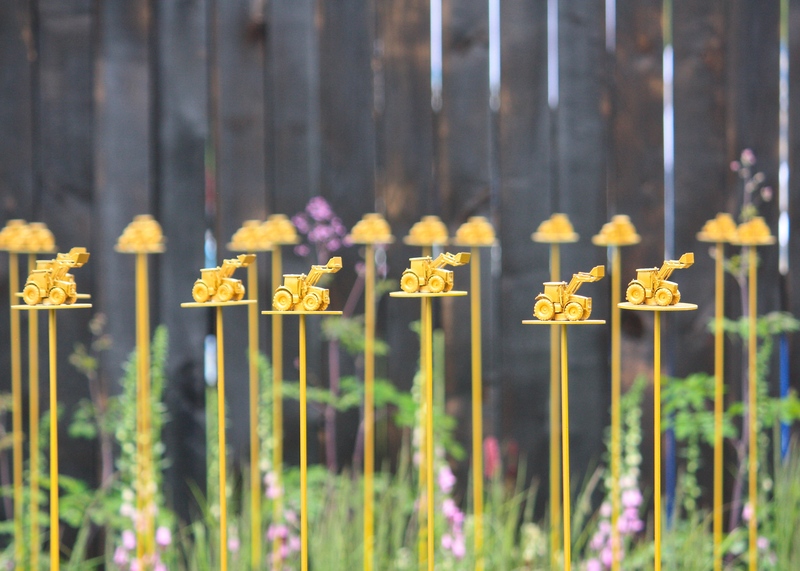 This garden was all about the agricultural, featuring a convoy of miniature golden tractors floating above a sea of Calamagrostis ‘Karl Foerster’ and Luzula nivea (snow-white wood-rush). 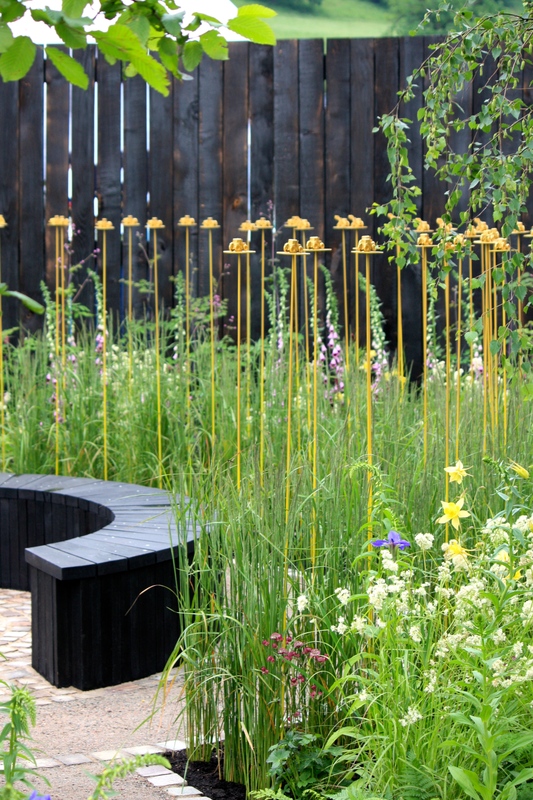 The garden was surrounded by a bold sweep of charred oak posts which did a sterling job of hiding everything behind. 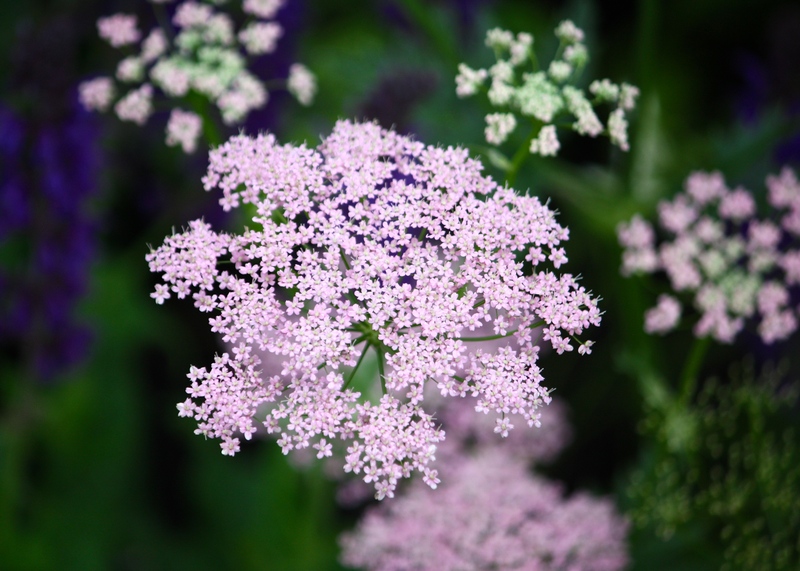 The blackened wood set off a fine selection of flowers, including one of my favourite spring beauties, Chaerophyllum hirsutum ‘Roseum’, an umbel that resembles a pinky-lilac cow parsley. 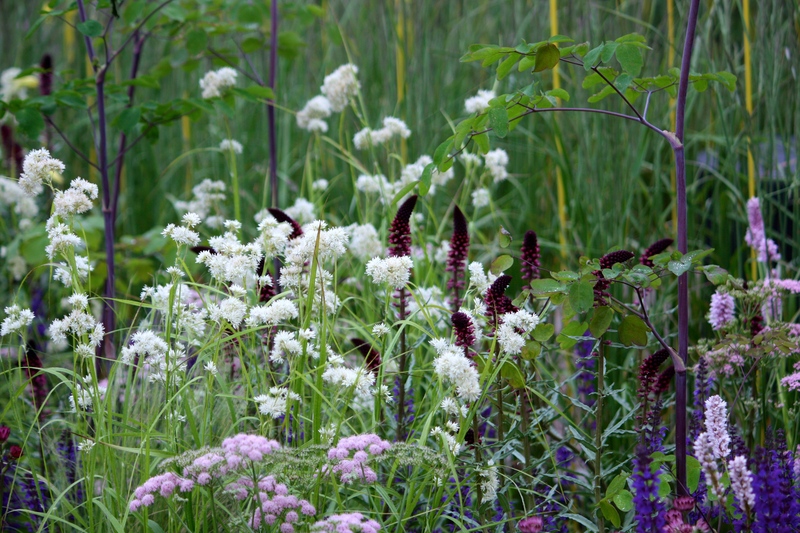 This garden was all about strong vertical lines, reinforced by plants such as foxgloves, lysimachia, persicaria and camassia. 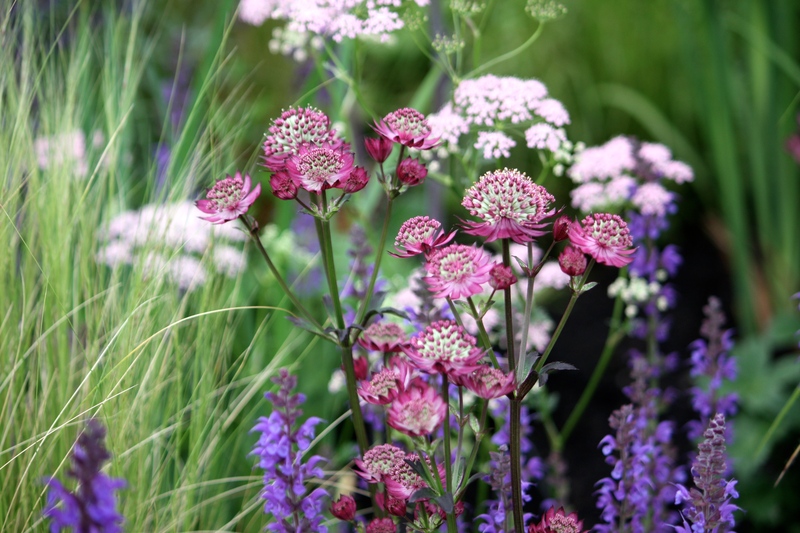 Blousy thalictrums and floaty aquilegias stopped the composition from appearing too upright and spiky. A pleasing design that struck me as better suited to a public space than a private one. By lunchtime the clouds had started to disperse. By 4.30pm, when my judging duties were over, the sky was clear-blue crisscrossed by fuzzy white vapour trails. All of a sudden my hat started to make me feel hot and I wanted to take it off. A fellow judge and I snuck up to Chatsworth’s walled gardens to seek out Becky Crowley, cut-flower grower extraordinaire, for a chat. I can heartily recommend her Instagram feed if you are easily excited by beautiful flower photography. 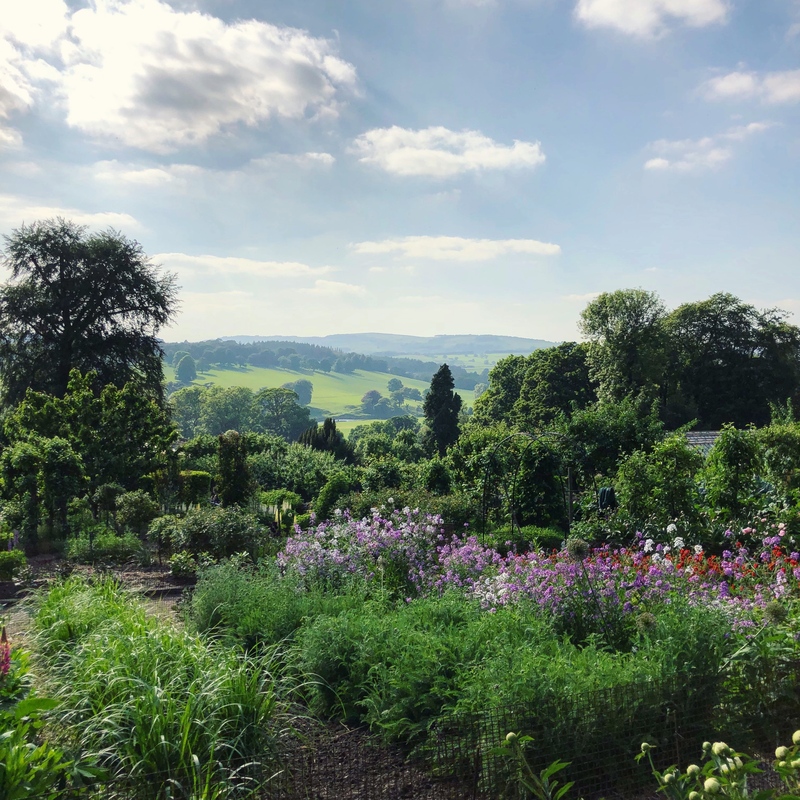 I found it hard to imagine that there could be a more beautiful place to work than here, looking out over rows of iris and peony to the Brownian landscape beyond. 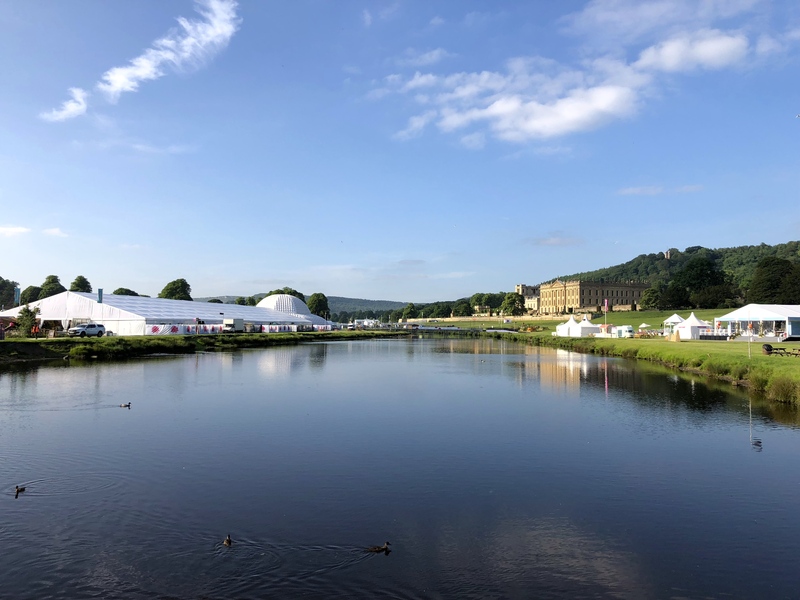 At 6.30pm, as the show ground closed down for the day, a golden light flooded across the River Derwent causing Chatsworth’s gilded windows to gleam with all the richness and magnificence they were intended to convey. The Man from Del Monte, having spotted only one, very small pineapple all day, returned home to Kent satisfied but empty-handed. TFG.